Cantor David Bagley is internationally recognized as one of the world’s leading cantors. His magnificent dramatic tenor voice and his deep understanding and interpretation of the liturgy have enabled him to reach the greatest heights in the cantorial art. At the outbreak of WWII he fled with his family to Japan and then to Shanghai China where he remained for six years. There he studied at the Mir Yeshiva. In 1947, he emigrated to the USA, officiating in leading synagogues. 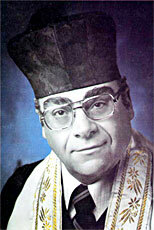 After the Six Day War in 1967, Cantor Bagley settled in Israel and was appointed cantor of the Great Synagogue of Ramat Gan. He joined the armed forces and was attached to the Air Force. During the three years he spent in Israel he often appeared in concerts as well as on radio and TV. The next six years were spent in South Africa at the Oxford Synagogue in Johannesburg. Music in this collection courtesy of Mrs. Klara Bagley.